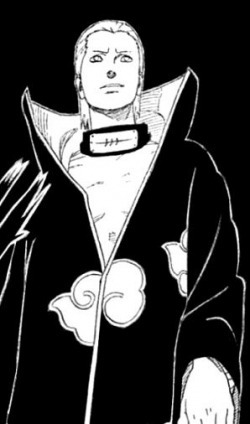 Pain (ペイン, Pein) is the recognized leader of the Akatsuki and Amagakure, and is a major antagonist in the series. He is referred to as "leader" by all Akatsuki members except for Konan, who refers to him by his name. Although he directs the actions of the other members and maintains authority over them, Pain takes orders from Tobi, who is actually Madara Uchiha. In addition to acting as Akatsuki's leader, Pain was the leader of the winning faction in the Land of Rain's latest civil war. The original body of Pain was a boy named Nagato (長門), who, like Konan and Yahiko were orphans from Amegakure, forcing them to fend for themselves. The three eventually encountered the Sannin, who at first were less than willing to help them. Orochimaru even suggested to kill them as they were orphans of war and as such would only live their lives full of misery. Jiraiya, however, decided he would care for the three and took them in. One night at dinner, Nagato cried because eating together reminded him of his family, and later that night he ran away with Yahiko. Then the two were attacked by a Rock chunin who injured Yahiko. Seeing this, Nagato activated his Rinnengan, and killed the ninja, a feat that is normally impossible for someone who has never trained as a ninja or never had any military or martial arts training. Jiraiya decided then and there he would train them in Ninjutsu. Nagato was very emotional about killing the shinobi, and asked Jiraiya for help so he can protect Konan and Yahiko, where Jiraiya said he must grow up. After three years, Jiraiya felt they were strong enough to fend for themselves and told the three he would see them again when they grow into adults. Jiraiya believed Nagato to have died with the others under unexplained circumstances, but has told Konan that whenever their names were mentioned outside their village, it was always about someone being killed when they opposed them. Pain has since led one side of the Amegakure civil-war and took over the village, he has become a greatly respected leader in that village. The members of Pain's faction wear their Amegakure forehead protectors with a scratch through it the way the full members of Akatsuki do, despite the fact that none of them are rogue ninja any more, as the scratch symbolizes, because they won the civil war. Nagato was a sensitive but kind boy, prone to crying, and was traumatized by the idea he had killed another man, even to save his friend Yahiko. Scared and unsure of his place in the world, he desired to help those he cared about, but never knew how. Nonetheless, he became a talented and gifted student, mastering every technique Jiraiya taught him. As Pain, his personality is very different having become a calm, serious, aloof, and detached man. Apparently believing his childhood trauma had enlightened him to the true meaning of pain and suffering, he now considers himself a deity and evolved beyond a mere human. He now seeks to show the world the meaning of suffering by using an ultimate weapon to deter future wars by means similar to "mutually assured destruction". He shows no moral qualms about his actions. He is willing to kill his own teacher in cold blood and brutally execute all of Hanzō's friends and family to ensure the Amegakure's compliance to his takeover. He even goes so far as to proclaim himself a "god of peace" come to guide the world to maturity through pain. He also feels that no one can understand peace unless they understand "true" pain, something his childhood friend Yahiko believed. Nonetheless, he can be quite respectful, particularly to the fallen. Given Akatsuki members' frequent bickering, he often restrains them and encourages better relations between the other members, even suggesting they mourn Deidara after his passing. After his battle with Jiraiya, he holds a moment of silence for his former teacher out of respect for his power. Pain is also very respectful and kind to his childhood friend, Konan, who has been declared his "angel". He was shown protecting her without request or hesitation from Jiraiya before his battle with his former teacher. She apparently is the only member of Akatsuki, aside from Madara, that addresses him by "Pain", and is the only one that calls him by Nagato. Normal 0 As the leader of Akatsuki and one of the two sides of the Amegakure Civil War, Pain is an extraordinarily powerful ninja that can easily be considered Kage-level; his partner Konan has stated that he has never lost a fight. He was able to single-handedly defeat and overthrow the former Amegakure leader, Hanzō, and made short work of Jiraiya after unveiling all six of his bodies (though Pain admitted that killing Jiraiya would have been very unlikely had Jiraiya had prior knowledge of his six separate bodies).The black body piercings on each of his bodies may be how he controls each body. This is supported by the Preta Path when it removes the body piercings from the dead Animal Path. Pain has been seen using many highly advanced techniques like the Shapeshifting Technique, which allows him to clone Akatsuki members using human sacrifices that they control and can use to engage enemies in place of themselves. The clones formed are perfect copies of the original, possessing any unique genetic traits or weapons they may possess. The clone's abilities are proportionate to the amount of chakra given to the clone. His most important technique in regards to Akatsuki operations is the Illusionary Dragon Nine Consuming Seals. With the other members of Akatsuki, this technique begins a three day trial to forcibly extract the Tailed Beast from its host and forces it into a giant statue. There seems to be an order on which Tailed Beast they can seal at once as they are unable to seal the Nine-Tailed Fox without sealing the other beasts as it would destroy the statue, possibly freeing all the captured beasts. His most powerful technique seen so far is the Shinra Tensei(Heavenly voice or Gods Judgement), a technique which manipulates gravity. His mastery of this technique allowed him to devastate half of Konohagakure with a single repulsion wave. However, it must also be noted that this massive repulsion wave causes a significant drain of Pain's chakra.To sustain this technique, his 5 bodies had to first give up all of their chakra, coupled with some of Nagato's own life force. Konan (小南) is the only female ninja in Akatsuki and the only member to call her partner, Pain, by his name. Her name means "Little South". When she was younger, Konan, Nagato, and Yahiko were left orphaned by one of Amegakure's many wars, forcing them to fend for themselves. The three eventually encountered the Sannin, who gave them some food. Konan impressed them by making an elaborate flower out of the paper wrappers left behind (she also wears one in her hair). After Nagato killed the Rock Chunin, Jiraiya took them up on their offer and began to teach them Ninjitsu. Jiraiya believed Konan to have died with Nagato and Yahiko some time later, and upon seeing her again years later, he comments on how beautiful she has become, as well as her improvement in her paper jutsu. Konan has a relatively mysterious personality. Mostly, she is stoic, calm, and level-headed (much like Pain). As a child, she was bright and relatively cheerful compared to the tough Yahiko and sensitive Nagato. However, the trauma of events since then have left her more serious and solemn and she never spoke until her most recent appearances. She does seem to be more empathic than other Akatsuki members, as she appears sad whenever she has been reminded of her past. She also expresses a great deal of loyalty and courtesy to Pain (which he always returns), doing his bidding without question and looking out for his well-being. She seems to act as an intermediary between Pain and Amegakure, the villagers having given her the title "God's Angel" for this reason. Fans suspect that she and Pain harbor feelings towards one another as both converse the way a married couple would. Moreover, Pain freed her from Jiraiya's grasp, without hesitation or request, first thing when he entered battle. Further, in episode 81 of Shippūden, as Pain is cycling the various members' reasons for fighting, as the camera focuses on Konan's projected face, Pain offers that "love" is her reason for fighting. She also has the ability to read Pain's emotions without him facially expressing them. As soon as Madara ordered Pain to capture Naruto Uzumaki and the Nine tailed demon-fox, she could tell right away that there was something about the order that upset Pain. Konan is a shinobi of great power, as she is held in high regard by her partner Pain. However, Jiraiya held her off with relative ease. She has a natural talent for origami, as seen with the paper flower she keeps in her hair. As a child, after training with Jiraiya, she was able to form paper weapons infused with her chakra, which could pierce flesh easily. As an adult and member of Akatsuki, her powers have grown considerably. She has created a unique transformation technique which can turn her entire body and clothing into thousands of sheets of paper, which she can control at will and form into any shape. To travel long distances, she can mold them into butterflies or planes for powered flight, and to attack, the sheets can form arrows, shuriken, or kunai. She can also restrain opponents by blanketing them in sheets restricting their movement. Befitting (and likely inspiring) her title as "Angel" (天使, Tenshi), the papers can also form large wings for flight or further weaponry. She does have weaknesses, though. Jiraiya covered her with oil to make her paper cling to itself and negate her abilities. It is possible she is also weak to water, as Pain stopped his rain technique before sending Konan out. However, when she was a child she seemed to have no problems fighting in the rain. Shino's bugs seem to be able to eat through her paper as well. Madara Uchiha (うちはマダラ, Uchiha Madara) also known as Tobi (トビ) in the Akatsuki, formerly appeared to be Zetsu's subordinate. Madara became a full Akatsuki member after Sasori's death and afterwards wore the same ring as Sasori having recovered it after his death and taking his place as Deidara's partner. After Deidara's death, he revealed his real name and that he had been the one giving Pain orders, making him the true leader of the Akatsuki. Only Pain, Konan, Zetsu, and Itachi Uchiha and recently Kisame (who recognized him as the former Mizukage) knew his true identity. He is one of five people who can use the Mangekyo Sharingan, the other four being his younger brother Izuna Uchiha, Itachi Uchiha, Sasuke Uchiha, and Kakashi Hatake. Tobi (飛) can be translated as "jump", while Madara (斑) can be translated as "spots". Eighty years ago, when shinobi were battling as individual clans, not as villages, among a countless number of them, two clans emerged as the strongest: the Uchiha clan and the Senju clan. Madara was also the first to activate the Mangekyo Sharingan. He had a younger brother, who was equal to him in every way and also awakened the Mangekyo Sharingan. Together they ruled over the Uchiha clan, with Madara taking the role as leader. But eventually Madara went blind, unaware of any side effects of the Mangekyo Sharingan at the time. He became increasingly desperate to regain his eyesight. During the final fight of Itachi and Sasuke, it is revealed that Madara took away his brothers eyes which killed his brother. Contrarily to what many believed, Madara claimed that his younger brother gave him the eyes voluntarily. At some point in Madara's early life, by the decision of the entire Uchiha clan except for him, he formed an alliance with the Senju clan, Hashirama Senju's clan, and together with its leader, the future First Hokage, Madara founded Konohagakure. However, after Hashirama was chosen to be the First Hokage of Konoha, Madara feared that the Uchiha clan would lose supremacy and he sought the help of the Uchiha in his challenge for leadership. The Uchiha clan, however, refused, believing he was greedy. None of the Uchiha would help Madara, and he decided to leave the village. Feeling hurt and betrayed, he came back and wanted revenge against Konoha, which led to a legendary battle at the Valley of the End against Hashirama. During the battle, Madara used his Mangekyo Sharingan to take control of the Nine-Tailed Demon Fox and used it in a desperate attempt to kill Hashirama. Madara, however, was ultimately defeated and was presumed by most to have died after the battle. Madara fled, and was never seen or heard of again out in the public for decades. To commemorate the battle, two statues, one of Madara and the other of the Hashirama, were carved into the earth around the waterfall. It is for this reason that Naruto Uzumaki and Sasuke's fight at that location was noted to be ironic. Madara created the criminal organization known as the Akatsuki to look over problems. He hid behind the shadows and placed Pain as the figure-head leader, with Madara giving Pain orders from the background. Outside of Pain, the only members who are shown knowing Madara's position as the true leader are Konan, Kisame, Zetsu and Itachi. Madara Uchiha prior to becoming Tobi. Itachi believes it was Madara himself that controlled the demon fox to attack Konoha, though Madara denies this, saying that the demon fox was a natural disaster. Nevertheless, when he came to destroy the entire village of Konoha in revenge, he met up with Itachi, who had already been assigned his mission to kill his clan. Itachi successfully talked Madara into only killing the Uchiha clan as long as he left the rest of the village alone. Madara also taught Itachi about the Mangekyo Sharingan, helping him by teaching him how to unlock its true power. After Itachi killed off the Uchiha clan because of orders from Konoha, Madara let Itachi into Akatsuki for unknown reasons. Itachi refers to Madara today as, "A pathetic shell of his former self, no longer worthy of being called the greatest Uchiha." It has also been recently revealed that at some point after being presumably killed, Madara took the role of Mizukage. Madara sometimes exhibits a very calm and serious personality and at other times he exhibits a playful disposition, especially when in the disguise of Tobi. He speaks with less formal diction, such as not using honorifics, and shows typically "villainous" arrogance. Despite this apparent arrogance, he is not above complimenting the abilities of Sasuke Uchiha and Naruto Uzumaki, if only for the interest of Sasuke's Sharingan and Naruto's Tailed Beast. Despite his villainous personality, during the first wars he wanted to protect the Uchiha clan and knew that the war would eventually extinguish it. Which is why, when the entire clan wanted it, he agreed on the peace treaty with the Senju Clan. Most of Madara's abilities are still unknown. But as he was regarded as the strongest Uchiha to ever live, it presumed he has mastered all of his clan’s jutsus and skills. Since the Uchiha clan is known for its fire techniques, it is also speculated that he knows advanced fire techniques as well. Considering he was once the Mizukage, it can be presumed he also has access to powerful water ninjutsu. Since a young age, Madara was regarded as incredibly gifted not unlike that of Itachi Uchiha. He was also noted to have been born with a particularly strong amount of chakra, which he states due to his "stubborn refusal to die". His chakra was strong even for the Uchiha clan, who were known for having strong chakra. The demon fox mentioned that Madara's chakra was even more sinister than its own. He was armed with a giant fan during the time of Konoha's founding, probably to fit with his clan's name, which means paper fan. It may also suggest that he had access to wind chakra and used the fan to enhance his fire jutsu similar to how Temari uses her fan. Madara’s prowess in battle has earned him a reputation rivaling that of the First Hokage, as he is referred to by Itachi as an "invincible immortal", yet he is also referred to as currently "a pathetic shell of his former self". Madara is also the only known wielder of the technique of summoning the demon fox, a being so powerful that it almost laid waste to Konoha until Minato stopped it. Madara was the only person capable of taming the demon fox, which was said to only come where human malice collects and festers. He somehow tamed the demon fox by using the Mangekyo Sharingan. Madara shows the ability to recover from what are presumably debilitating or fatal blows. After being slashed across the midsection by Sasuke's sword, he collapses, only to stand up again a few seconds later and complain about the speed of the attack, and later when Naruto hits him in the back with a Rasengan. The attacks literally phase through him, avoiding damage. He is also seen being hit by Itachi's Amaterasu but emerging unharmed. It may also be possible that he might have the same ability as Sasuke, to make the Amaterasu flames vanish or he could have just teleported the parts of his body that were hit. However, Madara's immortality may not be perfect as he suggested that if he hadn't kept some secrets from Itachi, he would have died by the Amaterasu Itachi implanted on Sasuke's Mangekyo Sharingan. Madara also shows the ability to travel long distances within relatively short time-spans, escaping the final explosion created by Deidara and reappearing in Amegakure, then travelling to the Valley of the End all within a very short time span. It is speculated by Kakashi and Sakura that he uses space/time Ninjutsu to instantly send himself or even parts of his body to different locations or some sort of void and instantly bring them back.Kisame also comments "he is a good runner." During his fight with Naruto and the rest of the 8-Man Squad, Madara demonstrated a mastery of space and time Ninjutsu that, as speculated by Kakashi and Sakura, surpassed even the Fourth Hokage. With it, he was able to take head-on a fully powered Rasengan by Naruto by having it phase right through him, and also when he escaped Shino's bugs even though they completely surrounded him. During Itachi's fight with Sasuke, it is revealed that Madara Uchiha and his younger brother were the first members of the Uchiha to activate the Mangekyo Sharingan, and used its power to take over the clan. After implanting his brother's eyes into his own body, Madara then awakened a new 'eternal' Mangekyo Sharingan. The 'eternal' Mangekyo Sharingan is a combination of his own and his brother's Mangekyo Sharingan. It gave him access and mastery to his clan's most dangerous jutsus, including a 'final ultimate jutsu' as Itachi stated, along with untold amounts of power without the risk of losing his eyesight. Madara's knowledge and mastery of this powerful Dojutsu allowed him to find on par with Hashirama and it gave him the power to forcibly subdue the demon fox. IT was also thanks to Madara's knowledge of this Dojutsu that Itachi learned how to properly use his Mangekyo Sharingan. Madara appears to have immense strength, as he was able to stop Suigetsu's giant sword with a single arm. To keep in Akatsuki's shadow, Madara eventually took on the disguise of Tobiand was placed within Akatsuki as Zetsu's subordinate. As Tobi, Madara wears an orange mask, with swirls focused around the right eye, that covers his entire face outside of his right eye. Before wearing the swirl mask, Madara wore a similar mask, with markings across it, which resembled the hidden mist villages ANBU mask, covering his entire face but the right eye. However, the mask does not bear the symbol of the Hidden mist village. 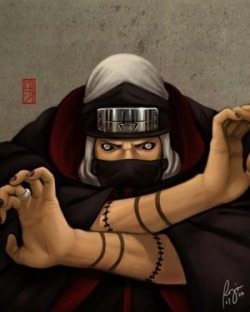 Furthermore, Tobi has several bolts or pins present on the arms of his uniform, obscured by his Akatsuki cloak. While acting as Tobi, unlike others within Akatsuki, Tobi is carefree and goofy, but Madara uses a very formal and correct manner of speech. While Tobi greatly respects his other members, referring to Deidara as Deidara-senpai in the Japanese version, most of the other members tend to get easily annoyed by Tobi. Deidara, who believes all within Akatsuki should be serious and calm, is not pleased with Tobi's childish personality, and frequently attacks Tobi in a comedic fashion when annoyed. Kisame and Zetsu, on the other hand, somewhat appreciates Tobi's ability to brighten up a gloomy organization such as theirs. As Tobi, Madara has not been seen wearing a forehead protector, probably to seal his identity, though he already has a mask covering his forhead. So this could also be why it is not visible. Although, it stands to reason that since Madara hates Konoha, he probably refuses to wear the head band anyway, like Orochimaru and Sasuke. Deidara (デイダラ) was a member of Akatsuki and was first partnered with Sasori before his death, then Tobi. He was the youngest member of Akatsuki. Deidara was originally from Iwagakure, although he readily abandoned the village for the opportunity of using his "art" more frequently as his village ridiculed him for it. Deidara became an assassin bomber for hire, not caring who he worked with so long as he could use his artwork. Sometime after Orochimaru left Akatsuki, Deidara was located by Itachi Uchiha, Kisame Hoshigaki, and Sasori, who were under the orders of the leader Pain to recruit him. Deidara refused at first, but was forced to join after being defeated by Itachi's Sharingan. Deidara, having taken a huge blow to his ego, carried a loathing for Itachi and other Uchiha for the rest of his life, though he was intelligent enough to recognize Itachi as a more powerful opponent. Quick to anger and annoy, Deidara was a very hot-headed man. Something of a sadistic arsonist, he was not above relishing a good fight, and he often blew up his opponents in a very brutal fashion. Deidara's most distinctive trait, however, was his love of art. He would respect any form of it, even if it disagreed with his own. Deidara also had a habit of ending his sentences with nasal "hmm" or "un" sound, roughly translated as "yeah". Deidara referred to his explosive ninjutsu as art, believing each bomb he made to be a significant accomplishment. He referred to his style as superflat (referring to certain types of art), and claimed pop (another art style) is dead. One of Deidara's catchphrases, "Art is a bang!" (or variations therein), was originally coined by famous Japanese abstract artist Tarō Okamoto (several of Deidara's explosives have resembled Okomoto's works too). Deidara was very proud of his art, to the point that he was simply unwilling to accept that anything could defeat it, leading to frequent overconfidence in battle. Deidara referred to his partner Sasori as Master Sasori (サソリの旦那, Sasori no Danna) out of respect for him as a fellow artist. He also admitted, at least outwardly that Sasori was more powerful than he was. In spite of this, Deidara wasn't above goading his partner, and they frequently squabbled over the nature of true art (Deidara holding that art is transient and departing quickly; Sasori believing fine art is something wonderful that's left long into the future). This reflected their individual natures (Deidara made clay sculptures that explode; Sasori made long-lasting puppets out of humans). Deidara outwardly seemed to respect Sasori's beliefs, but couldn't resist getting a final jab in after Sasori's death. Deidara's partnership with his second partner Tobi, however, was very different. Tobi apparently held a great respect for Deidara and frequently called him "senpai" (senior). Tobi's carefree and goofy personality did not please Deidara, who believed that all Akatsuki members should be serious and calm. Tobi frequently and unintentionally angered Deidara, which usually resulted in him attacking Tobi in a comedic fashion (e.g., blasting him with his exploding clay or strangling him with his legs). In battle, however, the two quickly set aside their differences and worked well together. Deidara also seemed to have a minor respect for Tobi, as shown when he apologized to his partner in his thoughts before he initiated his Self-Destruction. Also, as revealed in the third databook; Deidara's favorite food was bakudan, a pun on the actual food (boiled eggs in surimi) and the Japanese word meaning bombs. A fancy and skillful fighter, Deidara possessed special mouths in the palm of each hand to create Exploding Clay, chakra infused clay that detonates with the command Katsu (喝) and a single-hand hand seal. This clay could be molded into a wide variety of shapes and forms, growing to large sizes when infused with chakra (with Deidara performing the necessary hand seals) and could be controlled at will. This allowed him to create living explosives to attack opponents at long range. Deidara could even create clones from the clay, named Suicide Bombing Clones, that could be a deadly surprise for opponents. Deidara's clay creations ranged from microscopic to gigantic in size, allowing him to adapt to any situation. Deidara could also use the clay for other purposes, as he was frequently seen creating birds to be used for transportation. It seemed he also knew standard earth-based jutsu as shown from his Earth Release: Mole Hiding Technique, which he used to avoid damage from one of his mass-scale bombs. However, he could potentially run out of clay if he used too much of it, leaving him vulnerable. In addition to his clay-based abilities, Deidara was very intelligent, often using tricks, misdirection, and calculated gambles to get his explosives in range of an opponent. As a long-range specialist, he was weaker in close combat, but skilled enough to hold off a close combat specialists like Team Guy, handling a kunai in his mouth, and had a variety of techniques in his arsenal to escape close quarters when necessary. He also wore a scope on his left eye for long-range observation, and he had trained the eye itself to counter genjutsu, allowing him to see through and negate them. This was done in response to Itachi's powerful genjutsu skills, of which he had a considerable loathing and resolved to defeat if he got the chance. Deidara's abilities were well recognized within Akatsuki and the leader, Pain, openly admitted that he was something unique, and that his loss was a major blow to the group. Sasori (サソリ, Sasori) also known as Sasori of the Red Sand (赤砂のサソリ, Akasuna no Sasori) was a member of Akatsuki prior to his death, and was partnered with Deidara, Orochimaru before that. He was the first Akatsuki member to die (at least on-screen) in the series. In the short amount of time that he was shown, Sasori was a relatively popular character. In the first poll he was in (the 6th overall poll) he placed 6th on the list. Sasori (蠍) means "scorpion". Sasori's complete lack of empathy might have stemmed from his tragic past. When Sasori was around five years old, his parents were killed by Sakumo Hatake, leaving him with no one but his grandmother, Chiyo, to care for him. Chiyo began to teach him the art of making puppets, and Sasori soon proved to be a born natural. He began to make puppets at the age of five, and even made puppets of his parents to get rid of the terrible loneliness he felt. Sasori, later infamously known as Sasori of the Red Sand, created many ingenious puppets, including the ones now owned by Kankuro. Later, he became missing-nin when he left Sunagakure twenty years before his introduction, but the background to his crimes is unknown but is presumed due to being found experimenting on people in an attempt to create human puppets. Flashbacks seem to indicate that his descent into darkness started when his parents died. As mentioned above, Sasori went so far as to simulate being with them by turning the Sand Village's malfunctioning puppets into puppets of his parents. This effort failed, (the puppets cracked) and he abandoned the puppets, although Chiyo kept them safe and upgraded them so they could be used in battle. Around the time of his defection, Sasori converted himself into a human puppet to maintain his youthful looks and increase his own offensive capabilities. Sasori is known for his impatience (he notes that he does not wish to wait or keep others waiting), which is quite ironic since he has all the time in the world thanks to his puppet-converted body. He has little empathy for his opponents or regard for human life, and he states that he will not feel anything if Chiyo dies from his poison or using her life energy to heal Sakura, as he claims that his heart has become like his puppet body. Sasori and Deidara both portray conflicting views of art, and they frequently argue about their different views. Deidara holds that art is something transient that departs quickly, where as Sasori believes that fine art is something wonderful that is left long into the future. This reflects their individual natures (Deidara makes clay sculptures that explode; Sasori makes long-lasting puppets out of humans). Deidara outwardly seems to respect Sasori's beliefs, but Sasori doesn't respect Deidara's. Deidara commented to Kakashi on how much stronger Sasori is compared to himself, however at the time of his death, Sasori had not yet captured his tailed beast. A short dialogue between himself and Deidara suggests that Sasori did not even know what beast he had been assigned to target. After his death, Tobi takes his place, and his ring, in Akatsuki. Sasori is a master of puppetry. His grandmother, Chiyo, began teaching him such skills at a very early age, and he created many puppets over his lifetime. Prior to his leaving the village, Sasori created the puppets Kankuro uses throughout the series; Karasu, Kuroari, and Sanshuou. His status as a master puppeteer affords him a tremendous advantage against other puppeteer shinobi, specially if the puppets they are using happens to be formerly his own, as seen on his battle against Kankuro. Along with being a master of puppetry, Sasori is also a master of poisons. His poisons take effect instantly, and one such poison kills the target after three days of suffering. To Sasori, this poison was untreatable. But to his surprise, Sakura Haruno came up with a cure for the poison. Sasori added this poison to virtually every weapon in his arsenal, making each blow potentially lethal for his opponents. Combined with his extensive knowledge of the human body and chakra, Sasori has also demonstrated highly advanced ability at sealing jutsu as shown from his longtime control over Yura and Kabuto. During regular combat, Sasori usually wears his puppets like armor and controls them from the inside, thus eliminating the puppeteer's weakness of being a separate and exposed target. Sasori's favorite puppet to use in this manner is Hiruko (ヒルコ), which he adorned with the regular Akatsuki outfit and wore so often that others came to recognize him only while he was wearing it. Also, when within Hiruko, Sasori has a deeper and more gruff voice. Hiruko has a long mechanical scorpion tail (allusion to his name meaning scorpion), extending from the mouth of what appears to be a mask, on his back, a recent addition to add extra defense to a weak point. The tail works as Hiruko's main offensive weapon, and at first seems to be indestructible, until; it was easily destroyed by the Sandaime Kazakage Puppet's clawed arm. The tail is also used as an extra defense, by spinning it around his body at a rapid speed. The left arm is rigged with a projectile launcher capable of firing shrapnel and needles, and the mouth can be opened to serves as a similar projectile-firing device, capable of firing poisoned needles, but with a more rapid speed. Although Sasori is in at least his thirties, he maintains the appearance of a teenage boy. Sasori's unnaturally young appearance is a product of his design. Most of Sasori's body (excluding his heart) is actually a puppet. In place of his stomach is a thick cable coiled around a pole, allowing Sasori to use it as a stinger and retract it as necessary. Attached to his back is a scroll holder, containing four scrolls that seem to serve as "ammunitions", which Sasori uses to store his human puppets, flamethrower and water jet capacities. Sasori also added a pair of poles to the back of his hips, each equipped with five large blades that that can spin like a propeller, and pipes to each of his hands, that can spew out intense fire, like a flamethrower, or powerful water jets. 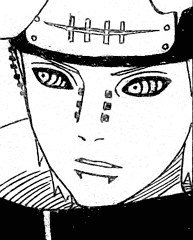 Curiously, when using "himself" Sasori's eyes are always wide open, giving him a somewhat manic look. In contrast, prior to revealing his puppet body, they were always half-closed, making him appear calmer. Installed in the right part of his chest is a mechanism that can spin numerous chakra strings, allowing Sasori to control, at least, one hundred puppets at once, amongst others used for his Red Secret Technique: Performance of a Hundred Puppets that he claims to have taken down an entire country, and giving him a drastic advantage over all other puppeteers. Sasori's left part of his chest holds the only part of him still human and thus the only, and needed, part of his body capable of controlling chakra, a cylinder-shaped device containing his heart. Because Sasori's heart was the only living part of himself, his puppet body is virtually indestructible; allowing him to survive the poison mist Kankuro bombarded him with as well as the impact from Sakura's punches. When smashed apart, he can simply draw the pieces back together. Additionally, he can transfer his heart to other puppets in a split second, allowing him to abandon a body should it be damaged beyond repair or otherwise incapacitated. How he transfers his facial features, as depicted in the manga, is not explained; at one point, he transfers to another puppet that somehow has his face. In addition to being a master puppeteer, Sasori's regular puppets are unique in that they are made from the still-living bodies of humans. These human puppets are more versatile than regular puppets, since in addition to having many dangerous devices installed within them (as is common with regular puppets), they are also able to use chakra and perform jutsu. Any jutsu or kekkei genkai abilities possessed by the converted human are also passed on to the puppet. Sasori claims to have a collection of 298 Human Puppets, 103 of which he actually displayed. His favorite human puppet is the Third Kazekage, which retained its unique magnetic chakra abilities, and thus can use the fearsome Iron Sand technique. Of course, mixed with Sasori's poison, the Iron Sand was given a more lethal edge. The Iron Sand can also be used to fill up the joints of other puppets, thus immobilizing them. The Kazekage puppet's right arm holds several poisoned blades, while the left arm can open up to reveal several summoning seals that summon thousands of similar arms. The several arms are capable of pinning down an opponent, and if that fails, they can release several poisonous gas clouds that are instantly fatal if inhaled. The summoned arms can also release kunai attached wires, to drag the opponent into the gas cloud. The arms can also fire several regular kunai. If the extra arms are cut off, a small buzz saw will take their place. Normal 0 Itachi Uchiha (うちはイタチ, Uchiha Itachi) is Sasuke Uchiha's older brother, and a missing-nin from Konohagakure, and a prominent member of Akatsuki, partnered with Kisame Hoshigaki. He and Kisame were the first active Akatsuki members to appear. Itachi (鼬) can be translated as "weasel".To some degree of Japanese belief, weasels are considered a harbinger, often signifying ill fortune (possibly a reference to his murder of his family and the rest of his clan). His surname, Uchiha, is another way of pronouncing uchiwa, or a "paper fan", which is actually the Uchiha clan symbol. An uchiwa can be used to fan flames, making the flame hotter, referring to the fact that the Uchiha is a clan of fire-jutsu users. Itachi is relatively popular among many fans of Naruto, often having ranked in the top ten in Shonen Jump magazine's popularity polls since his introduction. He was first ranked in the third character popularity poll ranked in 11th place. He was ranked 9th place during the fourth popularity poll, and 6th place in the fifth popularity poll. During the sixth, most recent popularity poll, he again was ranked in 11th place. A genius above all others, Itachi was born into the Uchiha Clan and praised by all as the best of his generation. However, not even his family, friends, or teachers could understand him. Not much is known about Itachi's childhood except that when he was only 4, Itachi had already witnessed countless lives lost due to war, which emotionally traumatized him and made him into a pacifist. It is also known that at age 7 he graduated from the Ninja Academy after only one year at the top of his class, mastered the Sharingan at age 8, passing the Chunin Exams at age 10 and becoming ANBU Captain at age 13. According to Madara, Itachi also had a lover, whom he killed during the Uchiha clan massacre. He was praised highly by his father, who saw the family's future in Itachi and neglected his other son - Itachi's little brother, Sasuke. However, during this time Itachi showed great affection towards his little brother, Sasuke, and even encouraged his father to come to the Academy when Sasuke was enrolled, something their dad had otherwise forgotten, by saying that he would otherwise not come on a mission. After being asked to spy on his clan by the village elders he started acting strange, not coming to the clan meetings and refusing to train with Sasuke. The village elders, finally sure of the Uchiha's plans to take over the village, ordered Itachi to eliminate everyone in his clan. With the help of Madara's teachings (and possibly the help from Madara himself), he slaughtered his entire clan overnight (with the exception of Sasuke). Due to the fact that Sasuke was never to know about the Uchiha's attempt at a coup d'etat and the Konoha higher ups's orders, and the fact that Sasuke's life was worth more than the village to Itachi. Itachi used his Mangekyo Sharingan to capture Sasuke in a Genjutsu and show him how he had killed everyone. After this Sasuke ran away, but Itachi confronted him again and explained that he did it all to test himself. He also explained that the new eyes he had acquired could also be acquired by Sasuke and all he had to do was to kill his best friend. Telling Sasuke that he let him live because he had the potential to become as strong as him, he also tells him to hate him and detest him, if he ever wanted a chance of defeating him. Ever since his first appearance, Itachi had always been mysterious and had acted as though he was hiding his true self. While flashbacks to his past show that he was a compassionate brother and person, his later acts and claims made it seem that this was mostly just an act. But, surprisingly, he actually was the compassionate brother he once claimed to be, but he hid this to protect Sasuke. As a member of Akatsuki, he possessed incredible self control of his emotions. He constantly displayed an emotionless personality, though at times, he appeared to have a slight degree of anger or frustration on his face. He only showed surprise when opponents proved more powerful or skilled than he had expected, and even then he didn't lose his composure. He did not possess any arrogance, and fully justified any statements he made about his power, and even complimented his opponents at times on their abilities. In addition to being an extremely powerful ninja, Itachi had also shown equally impressive intelligence. He was shown to be extremely mature and wise for his age. He was a very keen minded individual as shown from how adept he was at thinking things through. He was exceedingly sharp and observant to any situation at hand as he was rarely surprised or caught off guard and also displayed great intuition he is almost never deceived and even then almost instantly realizes the truth. In addition, he had also shown to have great deduction and analytical skills from how quickly he could determine his opponent's tactics and effectively counter them. Despite his status as a wanted criminal and having murdered a significant portion of his family, Itachi had no enjoyment of violence or combat, instead preferring to avoid battle or, if this is not possible, end it as quickly as he can. Itachi's only initial interest was in Akatsuki's goals and his only loyalty appeared to be to the organization and its members, putting the organization's success and secrecy before everything else. As such, Itachi got along with his partner, Kisame, much better than most other Akatsuki members do with their own partners. Kisame appeared to have a deep loyalty to Itachi, immediately doing as he instructed and constantly looking out for his well-being. Itachi treated all of his fellow Akatsuki members to this same, more respectful personality, although his courtesy was rarely returned by the other members. However, when he was in a Genjutsu duel during his fight with Sasuke, he aggressively and violently claimed he only let Sasuke live so he could take Sasuke's eyes and obtain his own Eternal Mangekyo Sharingan, and then he claimed the Uchiha clan was nothing but tainted and evil since many members would kill their friends to gain the Mangekyo Sharingan, and take another Uchiha's eyes to make its power permanent. Once the Genjutsu was released, he called it his true self, implying his calm, emotionless personality was also a facade. Madara, however, later revealed that this was not the truth. Itachi really was the brother that he once claimed to be only an act. He had killed his clan only because he had been ordered to by Konoha to stop the Uchiha from rebelling against the village or else Konoha would have been destroyed if a clan as strong as the Uchiha rebelled. His childhood experience in war had caused him to greatly fear and detest the violence the Uchiha could cause, so he made the incredible sacrifice, and decided to murder his entire family, creating the image of his "evil" side that so many had known him to be. Not only sacrificing himself for Konoha, but he knew that Konoha would destroy the Uchiha anyway even if he did not comply. Itachi though he was in a position of power to barter for Sasuke's survival if he went through with the deed himself. Deep down, Itachi had cared a lot for Sasuke, so he never revealed the treachery of the Uchiha clan to keep his brother believing their clan was a noble one. Itachi had always planned to die by Sasuke's hands, so he could compensate for all he had done by making Sasuke's name known as the hero who defeated the one who slaughtered the Uchiha clan. The reason why Itachi didn't kill Sasuke was because he loved Sasuke more than anything else. Itachi is a very caring person towards his brother although he doesn't like to show or mention it to anyone. Since a young age, Itachi's intellect and talent have shown their brilliance in everything he did, as even his teachers said his progress hardly required any help. In the few battles he had been seen in since the start of the series, Itachi was shown to be an incredibly powerful ninja, and easily one of the strongest in the Naruto Series, as demonstrated by his ability to easily defeat Deidara, Kakashi Hatake and Orochimaru, who themselves are considered amongst the strongest ninjas in Naruto. Itachi was a master of all the Uchiha clan's techniques, the sharingan, and had great prowess with the all the three main types of jutsu. According to Sasuke, Itachi's tactics usually involved the usage of crows. Being a pacifist, Itachi did not actively take part in battle, typically only acting in self-defense. From a stationary position he would study an opponent's movements with his Sharingan and respond accordingly, often with a genjutsu. He could cast a genjutsu by merely pointing or looking at someone, and could similarly turn an opponent's genjutsu against them. Itachi was also noted to be very fast, particularly with his hand movements. This extended to weaving hand seals and throwing weapons, as neither Sasuke nor Kakashi (Sharingan users) could follow his movements in either case. Itachi possessed the Mangekyo Sharingan, which increased his already great power, and enabled him to use his most powerful techniques. With his left eye, he could use Tsukuyomi, a genjutsu that traps an opponent's mind in an illusionary world, torturing them for what seems like days in a matter of seconds. With his right eye he could use Amaterasu, a ninjitsu which allowed him to create a black flame that he can direct with his eyesight to burn through seemingly anything in its path, including fire itself. His final technique was Susanoo, a technique that manifested as a spectral being labeled as the "Raging God of Battle" in the databook. It wielded the Totsuka Sword, a spectral sword with the ability to seal anything it pierces into the gourd that serves at its hilt, and Yata's Mirror, a shield that can reflect any attack. Zetsu, a fellow Akatsuki member, stated that Itachi's mastery of the Sharingan combined with the legendary weapons of Susanoo made him invincible. Despite his mastery of the Mangekyo Sharingan, Itachi suffered greatly from its side effects. His eyesight would worsen after every activation of the Mangekyo Sharingan, and he would eventually go blind from its power, with his Sharingan forever sealed away. Itachi was so close to blindness that by the time he activated Susanoo in his final fight, both Sharingan eyes had gone almost blind and turned white. However he was still able to perform his own Füinjutsu in his last moments. Kisame Hoshigaki (干柿鬼鮫, Hoshigaki Kisame) is a missing-nin from Kirigakure and was partnered with Itachi Uchiha within Akatsuki. Kisame is a former member of Kirigakure's Seven Ninjas Swordsman of the Mist, an ever-changing group of ninja that wield particularly large weapons in battle. While in Kiri, Kisame was given the title of "Monster of the Hidden Mist". He is also known to have formed a connection to Suigetsu Hozuki and his brother. His former country, the Land of Water, now seeks him out for plotting to overthrow its government and being involved in numerous assassinations.Kisame later joins Akatsuki and was partnered with Itachi Uchiha. Pain states that his reason for joining Akatsuki is "Spite". 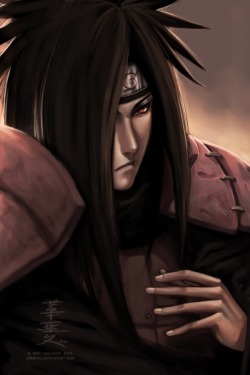 This immortal freak and a religious man, he is one of the akatsuki members that is most lethal. His Partner Kakuzu and him captured Yugito. After they went in search for naruto finding asuma, shikamaru, and their squad waiting for them. Asuma took on Hidan and died because of Hidan's super natural jutsu. The second time he ran into shikamaru he was out strategies and was blown to pieces. Still alive shikamaru burried him. Known Jutsu: Summoning jutsu, "His 4 demon hearts"
His obsession for money blinds his path. Acting as akatsuki's bounty hunter and financial aid. He is Hidans partner with an ability like his. He has 4 demon hearts and in orfer for him o die you must destroy all of them. He battled Kakashi, naruto, choji, and ino while hidan took shimkamaru. Kakashi managed to take out 1 heart. He later summoned the monsters. After the battle end he naruto tried out his new jutsu Rasen-Shuriken and blew the last of kakuzu's remaining hearts. Turning out that he died and with further reasearch tsunade saw that Rasen-shuriken sends little sharp microscopic chakara spears in your body canceling out chakara pionts permanatly and ripping your opponent while your at it. An akatsuki member that always travels alone. He always pops up to witness battles that he knows are gonna be good. Like when naruto and Sasuke fought he was there. Also Itachi and sasuke's battle. He is one of the akatsuki members that knows madara is pulling the strings.